Analoger Fotostammtisch #14: Show & Tell • analogueNOW! Analogue photographers come together and present their photographs to the audience. After that there is room for discussion, feedback and nice get-together in the Ida Nowhere. Do you have a project related to analogue photography, that you would like to show? Write a short email to e.freaza(at)analoguenow.com til 10th of April and we’ll reserve you a spot in one of our tables. 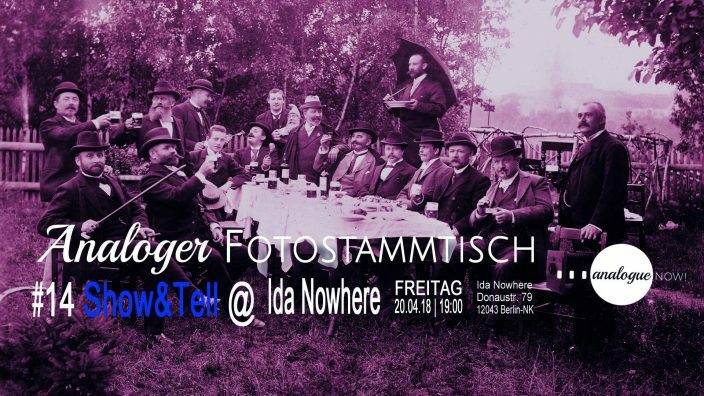 This “Fotostammtisch” will be held, according to the nationality of the photographer in German oder English language, but with the focus on the pictures, you will understand mostly everything. Admission is based on a small donation.